Rudolf Biebrecht was educated at the Academy of Art in Leipzig and worked as a woodcutter before he took acting lessons. In 1890 he was engaged the Neues Theater in Giessen and engagements in Magdeburg, Düsseldorf, Bremen and the Thaliatheater in Hamburg followed. In 1895 he married Elisabeth Letzer. They had a son, Rudolph (b.1899). From 1901 to 1905 he worked for the Stadttheater in Leipzig and from 1905 to 1910 for the Stadttheater in Chemnitz. In 1913 he debuted in the movies with "Tirol in Waffen". During the First World War he also worked as a director and he frequently collaborated with Henny Porten until 1919. He also worked with Lotte Neumann. In 1919 he married Getrud Wiesel, the daughter of the mayor of Leipzig. They had a daughter, Erika Margot. In the 1920s he concentrated on acting again. In 1926 he became the leader of the acting school of the UFA. 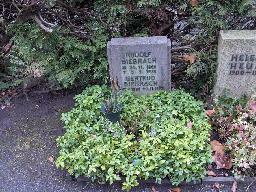 The grave of Rudolf Biebrach at the Städtischer Friedhof Wilmersdorf, Berlin.